The Tennessee Aquarium Conservation Institute (TNACI), Georgia Department of Natural Resources, and the Conasauga River Alliance have initiated a collaborative restoration project on a spring in the Conasauga River drainage of northern Georgia. We are trying to remove excessive sediment from the spring to promote growth of native aquatic vegetation and increase population sizes of the coldwater darter, Etheostoma ditrema. Coldwater darters are State Protected across their entire range, and declined at this site after logging of the surrounding catchment several decades ago. 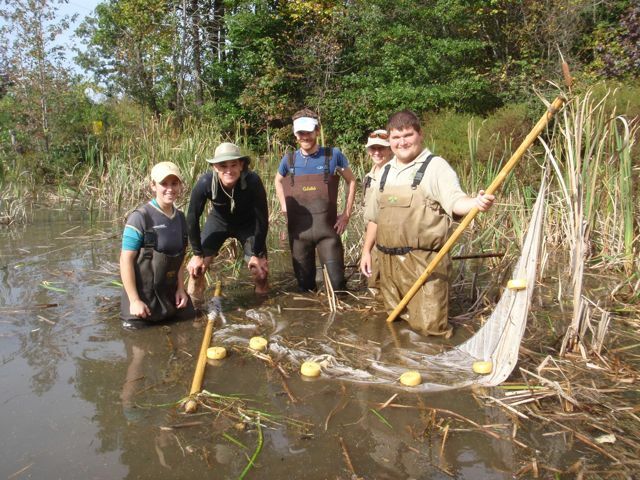 Volunteers are needed to help seine and dipnet fish and aquatic salamanders as part of a three-pass removal effort on 19-20 October, 2010. Our goal is to perform a population estimate of coldwater darters (as well as other fish and salamanders), while removing as many fish from the spring to reduce mortality from silt removal efforts scheduled for the following week. Fish will be transported to the Tennessee Aquarium Conservation Institute facility in Cohutta, GA and maintained temporarily until we have completed our habitat treatment. Volunteers should be prepared to get wet and muddy; the spring has silt deposits of up to 1.5m (but with beautiful chert gravel underneath!). I would recommend bringing either a wetsuit (preferred) or waders, snug-fitting shoes or boots, a towel and extra clothes, drinking water and lunch. Parking on site is somewhat limited (and the site is on private property); we hope to meet at TNACI at 0800 each morning and carpool to the site. There are abundant lodging options near Dalton; campgrounds nearby, and possibly some other options. If you are interested in helping with this effort, please contact Lee Friedlander at lsf(at)tnaqua.org for directions to TNACI and further details. Dave, I really wish that I could join you... almost feel like the Conasauga should be something that, as a responsible NANFAn, and in my own 'backyard', I should be responsible for helping with. But employment occasionally trumps my avocation... and this is one of those times. Normally I would just take the days off, but I have pre-scheduled meetings that cannot be moved. Sorry, but do keep informing us here of opportunitites such as this. Any of you aout there that are from Georgia... the Conasauga is a gem of our state (OK and Tennessee too) not to be missed... and something that we should be involved in protecting. Please support Dave, TNACI, and Georgia DNR in this important effort... this is your chance to put actions to your appreciation for our native fishes. Were this a weekend event, I would almost certainly be able to attend and help out. I am excited at the opportunity to become involved in a restoration project so I look forward to hopefully being able to participate in future events. Please continue to post them - particularly if they take place during weekends/holidays. Thanks.